BANGI, 22 Oct 2012 – The National University of Malaysia (UKM) described as being at the forefront of research in both revealed and intellectual knowledge has a lot to offer ASEAN members. 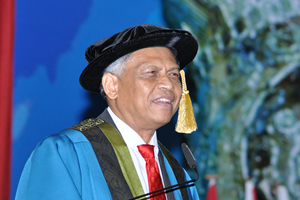 Secretary General of ASEAN and former Thai Foreign Minister, Dr. Surin Pitsuwan said there is a strong convergence of both knowledge in UKM and with its networking it can contribute to the well being of ASEAN by sharing its findings. UKM contribution in sharing research findings with ASEAN is very important because it is a university with excellence in knowledge that has the best of both worlds. 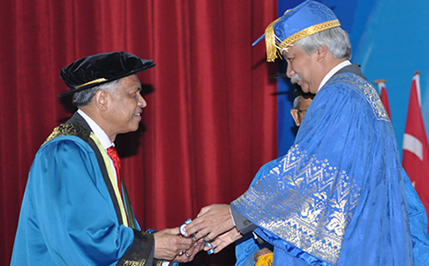 Speaking after being conferred an Honorary Doctorate in International Relations by UKM Chancellor, Tuanku Muhriz Ibni Almarhum Tuanku Munawir at the fith session of UKM convocation today, he said the convergence of revealed knowledge and knowledge derived from research will benefit ASEAN. This is invaluable because knowledge that is gained by investigation and research will have more impact if it is consistent with knowledge that has been revealed and carried out in a guided manner. In UKM the issue of conflict between science and revealed knowledge does not arise instead each field complement each other, he said. The convergence of these two fields will aid collaboration between science and revealed knowledge as branches of knowledge that are consistent instead of being at odds with each other. The inspiration which gathered from these convergence, will lead to investigation, research and networking which will bear fruits that can be shared with ASEAN. The benefit of this convergence is great and it will lead ASEAN toward peace, security and prosperity naturally, Dr Surin said. This phenomenon of science and revealed knowledge working together will open new frontiers of knowledge discovery and breakthroughs. Dr Surin who was conferred the honour for his contributions towards strengthening relationships between Asean members said he hopes to be able to contribute towards elevating UKM to a higher plain, with faith and Taqwa. He began his working life as an academic in the Faculty of Political Science at Thammasat University and later went on the do his PhD on Middle East Studies at Harvard University. He had carried out various research projects at the American University in Cairo, Egypt while also served as a Fellow at the Higher Institute of Islamic Research. He had also served as a member of the Academic Advisory Board of the Oxford Centre for Islamic Studies. At the international level he had served in many international bodies including the World Commission on the Social Dimension of Globalisation of the International Labour Organisation (ILO) and member of a number of International Advisory bodies including the United Nations Trust Fund for Human Security as well as the International Crisis Group (ICG) founded by the World Bank.